The old saying, "I scream, you scream, we all scream for ice cream!" is exactly what you will be shouting from rooftops once you make my incredibly luxurious (yet so easy) Vanilla Bean Ice Cream! There are some recipes that use a handful of really good, flavorful, and fresh ingredients, that result in what I call "heritage recipes." These recipes embody the essence of home cooking and will make an appearance at your table for decades to come. My ice cream recipe certainly falls into that category! 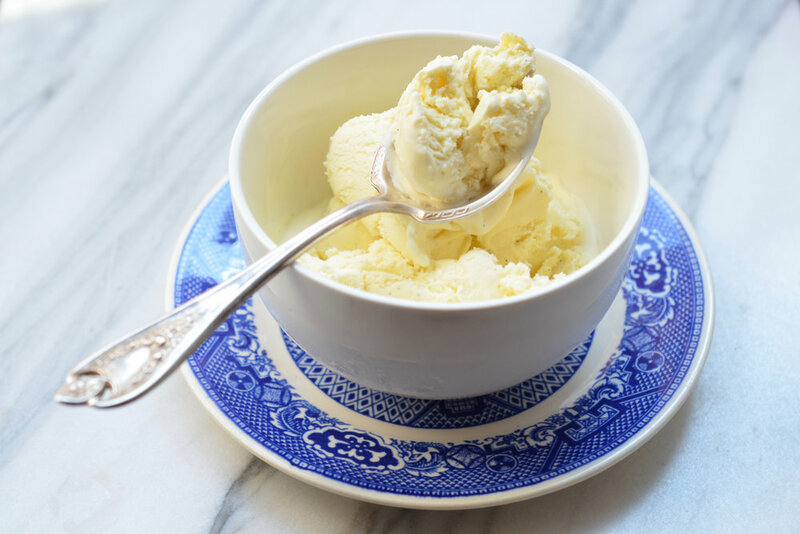 It uses just four ingredients, takes only minutes to assemble, and is the epitome of what vanilla bean ice cream should taste like, with fresh cream flavored with vanilla and a hint of briny sea salt. Whether you plan to serve this vanilla bean ice cream on top of a slice of pie, a French apple tart, galette, or by just itself (drizzled with salted caramel sauce, my favorite! ), you will be moved to scream for ice cream from rooftops from now on! Watch: Another #MJSmoments on YouTube. Subscribe to my YouTube channel by clicking here! In a medium sauce pan set over medium heat, add the heavy cream, sugar, vanilla bean paste, and fleur de sel. Stir until the sugar is dissolved. Transfer to a bowl and cover with plastic wrap pressing it directly onto the surface of the mixture. Chill the mixture in the refrigerator for at least 2 hours, or until very cold.